I mentioned in LED lighting for bathroom that the LED strips I had bought from China were much yellower than I expected and were lower-powered than the seller claimed. I believe that they sent me a different LED strip than what they had advertised (a cheaper product using 3030 LEDs instead of 5050 LEDs), but that is a risk one takes in ordering through AliExpress. Although I could have started a claim against the seller, I had already cut up and installed the strips, so I did not feel justified in asking for a refund. The amount was small enough that I just wrote it off and ordered another set of LED strips through AliExpress, making sure they were from a different seller and were well described on the web page. The new strips did indeed use the 5050 SMD LEDs that both strips claimed to use—the LEDs were substantially larger, through the strips were the same size. I installed the new strips alongside the old ones, and they are substantially brighter and whiter. It is also clear that the old power supply I was using was not able to handle the load of the new strips, reaching a current limit of about 1.5A with voltage dropped to about 11V (though it claimed to be 12V 2A). I have ordered a new 12V power supply, Mean Well SGA60U12-P1J, which is a modern, efficient power supply and should be able to deliver 5A. Will that be enough? Because my old supply was being limited by the current it could supply, I did not have a good estimate of the power needed by either the new or old strips. In both cases, the seller had said 14.4W/m, which is 1.2A/m @ 12V. I know that spec is wrong for yellowish lights (they are smaller LEDs than the 5050 LEDs I’d ordered), but I was curious what the power consumption really was. So I decided to measure a 5cm length of each of the strips (5cm is the smallest unit for the strips, standard for most LED strips). The 5050 strip has 3 resistors in each unit, so consists of 3 copies of a 150Ω resistor in series with an LED module that internally has 3 LEDs in series. 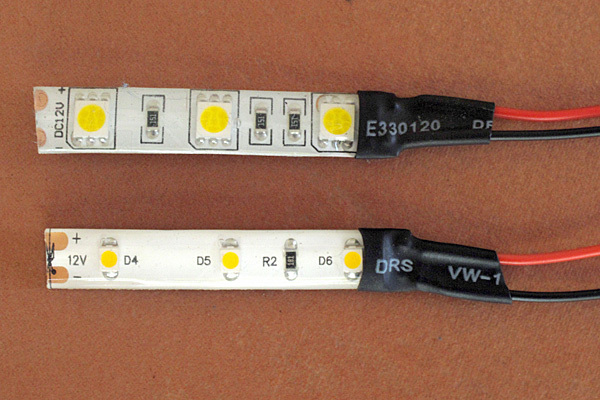 The yellowish strip has only one resistor in a 5cm segment, so consists of three LEDs in series with a 100Ω resistor. I can tell the resistor values, because they are clearly labeled SMD parts. To make the test pieces, I cut the strips at the 5cm cut line, then used a razor knife and a pair of long-nose pliers to peel away the waterproofing from the copper pads. I soldered red and black stranded wires onto the pads, then used some heat-shrink tubing to insulate and stabilize the connection, providing a tiny amount of strain relief. The newer 5050 strip is on the top. The incorrectly shipped 3030 strip is on the bottom. I wanted to make I-vs-V plots for the LED strips using PteroDAQ, but the Teensy board ADC is limited to 3.3V, and the voltages I needed could go well over 12V (12V for the LED strip plus whatever I needed for the current sensing). I could keep the voltage down for the current sensing by putting the current-sense resistor on the ground side of the LED strip. If the 14.4W/m @12V figure from the seller is accurate, then I’d expect about 60mA for a 5cm section, so a current-sense resistor <55Ω would keep the voltage in a measurable range. But to measure the voltage across the LED, I need a voltage divider. My first attempt was to use a 62kΩ and a 15kΩ resistor to get a nominal divider ratio of 0.1948. To check this ratio, I used the function generator to sweep over most of the 3.3V range, measuring the input and output of the voltage divider at each point with two channels of PteroDAQ. I saw some weird non-linear behavior of the output of the voltage divider vs. the input, so I did a fit assuming that the ADC had a fixed offset voltage, besides the scaling of the voltage divider (this 2-parameter model worked better for tests that I’ll describe below than just a scaling by the voltage divider, so I used it for this initial test set also). 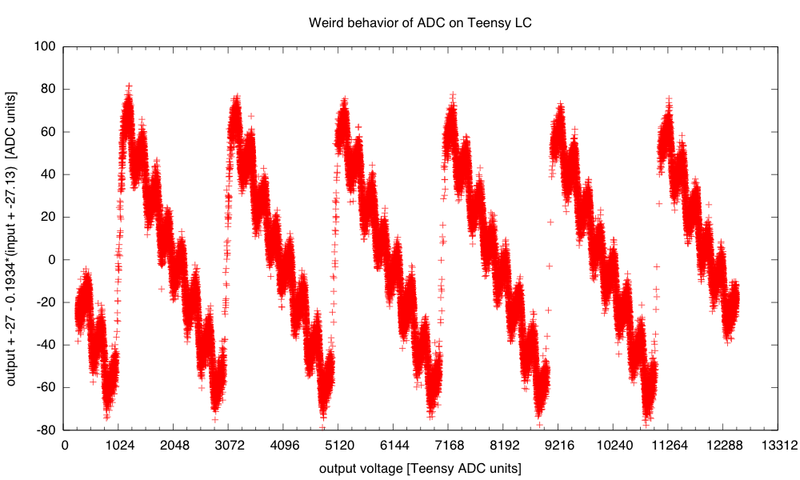 Although I usually make PteroDAQ measurements in volts, I redid the measurements in raw ADC integer values, because the pattern of the values suggested a relationship to the binary encoding. 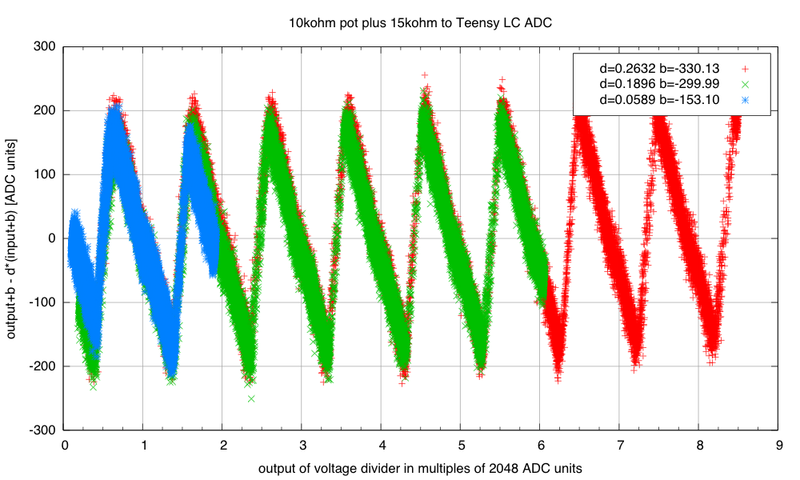 The error in the output voltage measurement shows a distinctive pattern, corresponding to the high-order bits of the ADC value. With the 10kΩ potentiometer, the patterning of the errors is barely visible, and the errors are much smaller than with the 62kΩ:15kΩ voltage divider. The offset was chosen for the d=0.0581 divider, but worked well for all the dividers. 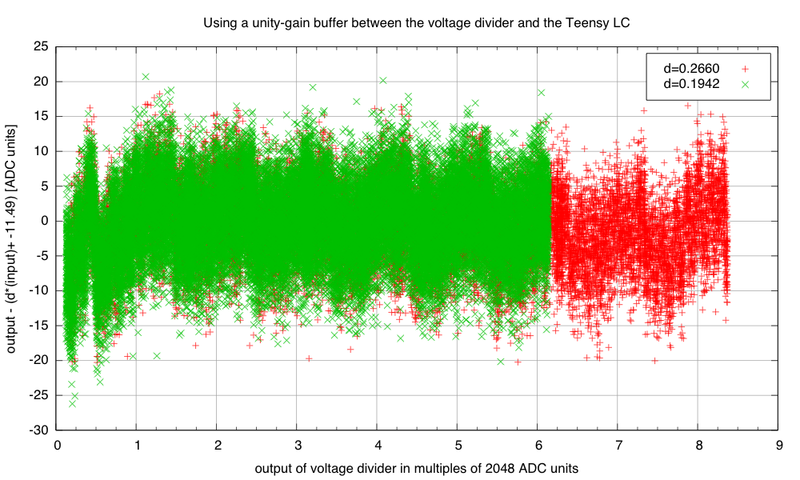 Given that the patterned errors were now much smaller than the random noise (which I had already minimized by using 32× hardware averaging), I suspected that the problem was not an inherent non-linearity of the ADC, but poor behavior of the ADC due to the high impedance of the source. I tested this two ways: first, by adding a resistor between the voltage divider output and the ADC pin (which should increase the source impedance without changing the voltage being measured) and second, by using a unity-gain buffer to provide a low-impedance source for the ADC pin. 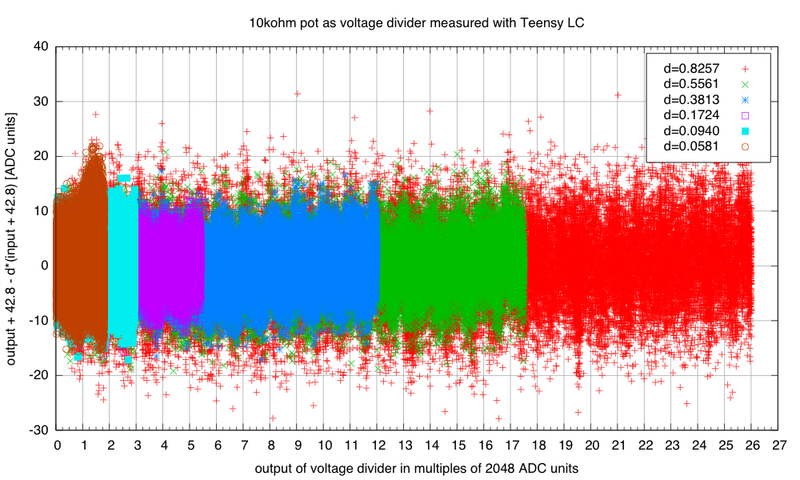 The problems with the 62kΩ:15kΩ ADC measurements were caused by the high-source impedance, since adding extra impedance to the 10kΩ voltage divider created similar problems. I also tried 62kΩ added between the voltage divider and the ADC pin, but that caused huge problems with reading the value. Adding a unity-gain buffer between the voltage divider and the ADC pin cleaned up the problem, though there is still a little patterning of the error. Here I modeled the offset as occurring in the unity-gain buffer, so that the offset is just on the divided-down channel, not on the other channel. This has exactly the same fitting power as a model that provides the same offset on both channels, but this model is more explicable, since op amps are known to have input offset errors, and the 580µV error estimated here is well within the ±4.5mV spec for the MCP6004 op amp. The divider ratio of 0.1942 is for the 62kΩ:15kΩ divider, which has a nominal ratio of 0.1948. So I was finally ready to measure the voltage and current for my LED strips. I put the LED strip in series with a current-sensing resistor, measuring the current-sense voltage with channel A0 and the divided-down and buffered LED+current-sense voltage with channel A1. Because my function generator is not capable of generating a 12V output, I put it in series with a 9V power supply, so it only had to generate -2V to +4V. Of course, since it has an output impedance of ~50Ω, and I was asking for up to 60mA, the function generator needs to generate higher voltages at the source, to compensate for the 3V IR drop. At 12V, we get 55.2mA/5cm or 1.1A/m for the 5050 warm-white strip and 18.1mA/5cm or 362mA/m for the 3030 yellow-white strip. 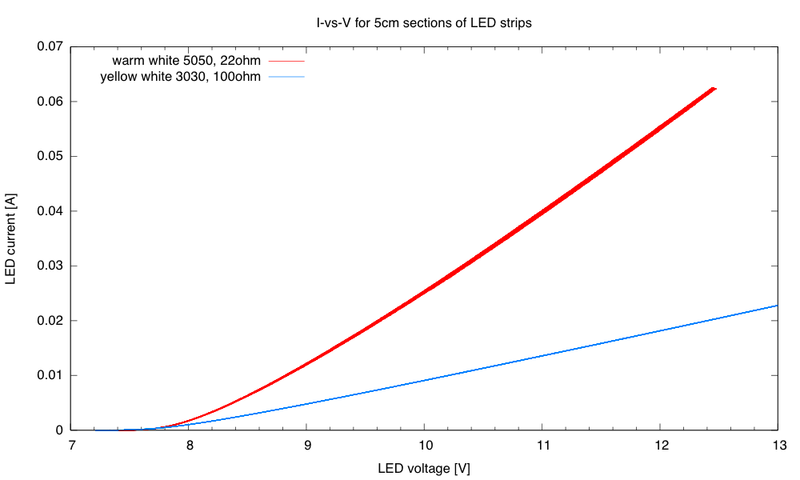 Note that for the 5050 strips, about 3.05W/m (of the 13.2W/m, so 23%) is wasted in the current-limiting resistors, and for the 3030 strips, 655mW/m (of the 4.34W/m, so 15%) is wasted. These losses are normal for LEDs with current-limiting resistors, which is why higher-power LED lights use switching regulators to control the current through the LEDs, rather than current-limiting resistors. I have 1.92.9m of each type of strip in the bathroom cove, so the total current needed is about 2.794.25A, well below the 5A limit of the new MeanWell power supply, but large enough that the power-supply will be in regulation and efficient (efficiency of the power supply is claimed to be about 88%). Assuming that the efficiency is as claimed, the new LED lighting should take about 3851W, considerably less than the 120W of the fluorescent fixtures that it replaces, but with about the same effective brightness and a more pleasing color. The simple resistance models are within measurement accuracy above 10V—measurement accuracy is limited by the changing of LED characteristics with temperature. I’ve been making a project of replacing all the fluorescent lights in the house with LED lights. 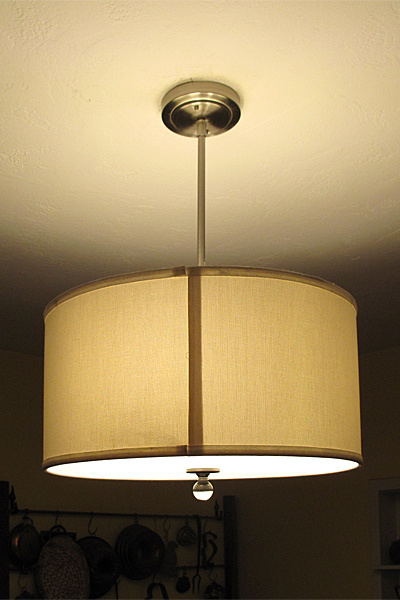 For the compact fluorescents, this is easy—when a CFL bulb burns out, I replace it with an LED bulb of similar brightness. 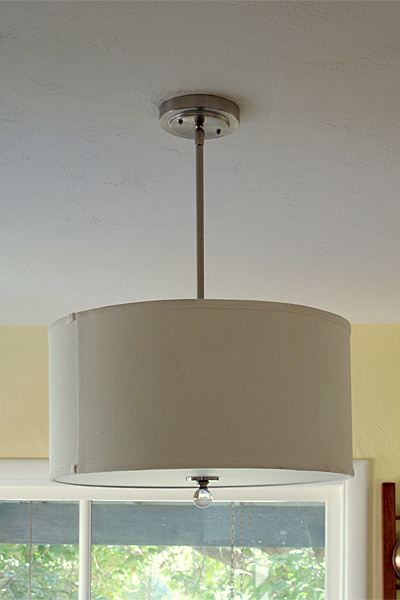 The tubular fluorescents in the kitchen, the bathroom cove lighting, and the dining-room cove lighting are more of a project. This weekend I finally got the fluorescent lighting in the cove around the skylight in bathroom replaced with LED strip lights. Unlike the kitchen LED lights, I did this project entirely myself. First, I removed the old fluorescent fixtures (2 40W and 2 20W fixtures) and replaced them with an outlet in the corner of the cove. Those fluorescent fixtures were 24 years old, from the 1992 remodel of the bathroom, and I’d never really liked them much—the ballasts tended to hum, and the bulbs needed to be replaced every few years. I then cleaned and painted the interior of the cove to make it more reflective (it had just a thin coating of primer before). It was a bit awkward working at the top of the ladder, and I managed to get a couple of smears of the semigloss paint on the walls of the skylight, not matching the previous matte white walls. Luckily they’re not too visible unless you are looking for them. I measured lengths of LED strips to fit the cove, cut the strips with wire cutters, shaved off the silicone waterproofing where I needed to make connections, soldered on flexible wires, and covered the connections with heat-shrink tubing. I also made a little barrel-connector-to-screw-terminals board to distribute the 12V power to two strips, with each strip connected to a different pair of screw terminals. Here is the outlet in the corner of the cove—because the cove was deep enough for the old fluorescent fixtures, it was deep enough to conceal the outlet box mounted vertically. The 12V wall wart connects to two LED strips, each of which covers half the perimeter. The strips have adhesive on the back, so I just stuck them to the middle of the cove. At two corners of the cove, I used flexible wires to connect separate straight strips. From below the light is a soft glow—there is additional separately controlled can lighting over the mirrors and over the shower stall, so the cove lighting around the skylight is only to provide diffuse ambient light, not bright task light. I bought 5m of 60 LED/m strip lighting from Aliexpress and used 3.9m of the strips. I measured the full 5m length as taking 1.13A at 11.5V (13W). I had expected the LED strips to take much more power, since the seller advertised them as 14.4 W/m, but that seems to have been a mistake (or a lie). The 3.9m I used should take about 10.1W, but the wall wart is using 20W, so it is only about 50% efficient. I may want to get a smaller, more modern wall wart, to get higher efficiency. There is a little less light from the 20W of LED lighting than from the 100W of fluorescent lighting, but not as much less as one might expect, and the soft yellow light is plenty for night-time trips to the bathroom. efficient modern wall wart for the pucks vs. old, inefficient wall wart for the cove. My wife rather likes the warm yellow light, so I’ll leave it alone for now. If I get irritated with it, I can always rip out the LED strips and put in new ones (the cost of the LED strips is < $20). I think that the soldering lab should not be the first op-amp lab, but I still like the idea of the students having to solder up their microphone preamps. So I’ll have to do a major reorganization of the book this summer, to move a different lab into the first position. Currently, I’m thinking that the transimpedance amplifier and pulse monitor lab would be a good choice as the first op-amp lab. After a rather rough start in the first half of the transimpedance-amplifier lab yesterday, I no longer think that is a good idea. The instrumentation-amp lab went much smoother, so may be a better first choice. Among other advantages, the instrumentation-amp lab with the pressure sensors has no analog filtering and simpler sensor sensitivity calculations. One disadvantage of moving away from the mic preamp is that the microphone and loudspeaker characterization in the first half of the class would be separated from the audio amplifier design in the second half—not a problem in a single quarter class, but potentially a bigger problem in a two-quarter sequence. It turns out that I had several errors in the draft of the book that the students were using for the prelab exercises for the optical pulse monitor. I’d decided in the summer or fall to switch to a new 700nm LED, but I’d only updated about half the scaffolding for the sensor sensitivity, so there were still a number of things that were only accurate for a 623nm LED. 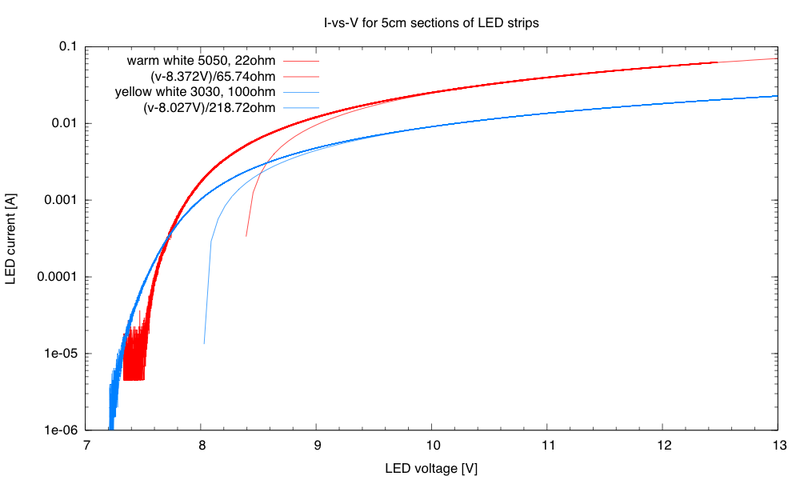 Also, I’d been using a datasheet for the WP3DP3BT that I’d gotten when I first started using the part, but Kingbright has improved their datasheet a lot between V3 (which I had) and V5 (the current one), so there is now a spectral sensitivity curve on the datasheet, and the spectral sensitivity is quite different from what I was expecting. I’ve started editing the book to correct the errors, but even after I fixed everything, the estimates for the current from the phototransistor were about 5% of what students were measuring in the lab. The model I had created, which worked fairly well for the previous LEDs, does not seem to work for the longer wavelength of the new LED. I’m considering simplifying the model by eliminating the modeling of scattering, to see how well that works. I should check the model with at least 3 different LEDs: the current 700nm one, the shorter wavelength ones I used to use, and an IR emitter. If I can get the estimates to be within a factor of 10 of measured values for all the LEDs I have, then the model is good enough to include in the book. I might also want to consider switching phototransistors to one with a wider spectral sensitivity, so that the estimation is not thrown off as much by the filter that blocks so much of visible light. That would allow me to try a green LED as well. I’m still thinking about doing a log-transimpedance amplifier as the first stage (not for the class, just for a demo unit) so that the pulse monitor can work in varying light levels up to full sunlight. The fluctuation in light from the pulse seems to be about 1%, which should be a variation of about 850µV out of the logarithmic amplifier (based on the 9.8mV/dB I measured in Logarithmic amplifier again). That’s a somewhat smaller signal than I’ve been getting with well-chosen gain resistors, but it may be worth it to get greater independence from the overall light level. In the freshman design class on Friday (2016 Feb 19), I did not cover any of the material I had queued up as things students might need. Instead, I responded to a question from one of the students working on the LED cube project about how pin multiplexing worked. I had covered this once before in the class, but in a rather hurried way, and the students did not appear to have investigated the designs on their own to figure it out. So I decided to take the time to go through the development of the idea from the initial problem to one of the many possible solutions. The problem is fairly simple to state: in a 4×4×4 RGB LED cube, there are 192 LEDs that need to be separately controlled—we want to be able to have any combination of them be on or off (I’m not getting into PWM control for adjusting the brightness in this class, though the hardware is not really different). The problem is that there are not 192 output pins on the Teensy boards, so they have to pack more functionality into fewer pins. I started out with the idea of time-multiplexing. We don’t really need every LED that is on to be on all the time—if we are willing to have the whole cube be dimmer, we can have each LED on only a fraction of the time. For example, if we are willing to have each LED on for only 1/16th of the time, we can make 16 time slots, assign each LED to one time slot, and only need to control 12 LEDs in each time slot. If we specify which time slot we are currently in with 4 pins (binary encoding of the 16 possible values), then we only need 12+4=16 pins to control the 192 LEDs. I then drew a grid of 12 rows and 16 columns (actually, I only showed a couple of each, and used …) and put an LED in each grid position, connecting the row to the anode and the column to the cathode. I then showed that if we had exactly one of the columns low, we could control all the LEDs in the column with a high voltages on the rows for the LEDs in the column that should be lit. We then looked at current-limiting resistors, deciding that it made more sense to put them on the rows than on the columns, because the number of LEDs lit on each row is either 0 or 1 at a time, but anywhere from 0 to 12 may be lit on a column. We can compute a resistor that provides the desired current for the row, but the column has very different current needs depending on the number of LEDs lit. We also discussed that all the LEDs on a row should be the same color, since the forward voltage for the LEDs is different for different colors, and the needed resistor size depends on the forward voltage at the desired current. (I reviewed how to do the calculation of the current-limiting resistor.) Note: choosing columns to have the cathodes and rows to have the anodes, combined with needing a single color on each row, puts a constraint on whether we use common-anode or common-cathode RGB LEDs. If the wrong type of RGB LED is bought, then the columns would have to have the anodes and the rows the cathodes. I suggested the use of a decoder or demultiplexer chip to decode 4 output lines into 16 column lines, with exactly one column being active. There is a 4-to-16 decoder chip available as a through-hole part (CD74HC4515EN), but it is a bit pricey, and students would be better off with a pair of 3-to-8 decoders (SN74HC138N), using the enable inputs to decode the remaining bit. Note: theSN74HC138N has an active-low output, with only one output low at a time (or 0, if the chip is not enabled). The CD74HC238E has an active-high output, with only one output high at a time. I did not talk about the different logic families and the logic levels needed for them. The HCT family, which needs a 5V power supply and uses traditional TTL signal levels is not a good choice for being driven from the Teensy outputs—the HC family is a better choice. We then looked at another problem. If we want 20mA in each LED, then we need up to 240mA for a column and 240mA combined from all the outputs. The Teensy boards can’t deliver that much power from the output pins! Even the decoder chip is only designed for about 6mA on the output. So we can’t drive the rows and columns from the Teensy or decoder outputs. For that matter, we can’t get 240mA from the 3.3V regulator for a Teensy LC or Teensy 3.1 (though the Teensy 3.2 is specified fairly conservatively to allow up to 250mA, which is barely enough). I suggested that we might want to power the LEDs off of the USB 5V power, which can deliver 500mA—more than enough. I then introduced field-effect transistors (specifically MOSFETs) as voltage-controlled switches. For the columns, we just need an nFET for each column, with a threshold voltage between 0V and 3.3V, so that it is off when the decoder output is low and on when the decoder output is high. The gate of a MOSFET takes essentially no current, and even the cheapest nFETs can work in this application. I showed the students how to use the DigiKey search page to find a through-hole nFET with a threshold voltage in a reasonable range and sort by price for buying 20. We talked about including the on-resistance of the MOSFET as part of the current-limiting resistance. The 5LN01SP-AC had an on-resistance of 7.8Ω, which is a little high—it might be better to use a slightly better nFET with a lower on resistance, as the column current varies with the number of LEDs lit, and we don’t want the brightness to change much. For about 13¢ more per transistor,we can get NTD3055L104-1G, which have a 100mΩ resistance—though that is for a 5V Vgs, and we are planning a 3.3V Vgs, which appears to increase the on-resistance by about a factor of 5, based on the current-vs-Vgs curves on the data sheet. We then looked at using a pFET to control the rows. The gate voltage would be 0V for an on pFET, and 3.3V for an off pFET, so with the source at 5V, Vgs is -5V for off, and -1.7V for on. We had a hard time finding many pFETs with a threshold guaranteed to be between -1.7V and -5V, so I added the idea of adding an inverter powered from the 5V supply, so that the gate voltage is 0V or 5V, and the threshold merely needs to between 0V and -5V, which is easy to meet (VP2106N3-G, for example, which has a 7Ω on-resistance for a 5V drive). We discussed the need to include this on-resistance in the current-limiting resistance calculation, but there is no need to seek a very low resistance, as only one LED is drawing current through the pFET at any time. We didn’t discuss it, but the decoder should probably also be powered from the 5V USB power, so that it can turn the nFETs on more completely, giving a lower on-resistance for the columns.